The Wave first reported a new homeless shelter coming to address 226 Beach 101st Street. The shelter will house roughly 120 single men, blocks away from multiple schools in the area. Here is a statement from Assemblywoman Pheffer-Amato. Teamwork! As Senator Sanders announced that he is conducting a collection drive to help federal workers affected by the government shutdown. 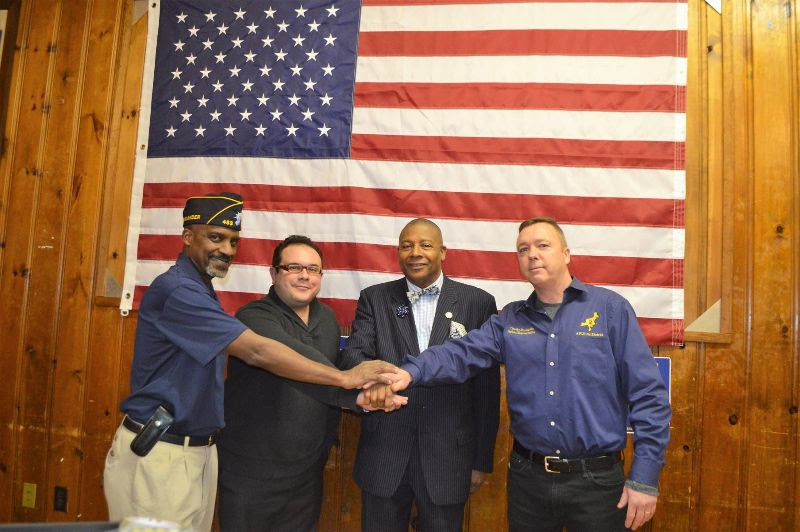 He was joined by supporters – William McDonald, Commander of the Rosedale-Laurelton American Legion Post 483, left, Gabriel Pedreira, Legislative Director and Political Organizer for the American Federation of Government Employees (AFGE) and Timothy McLaughlin, National Representative, 2nd District, American Federation of Government Employees. Senator Sanders, left, and William McDonald, Commander of the Rosedale-Laurelton American Legion Post 483, display some of the food available at the legion’s pantry including chicken and carrots. 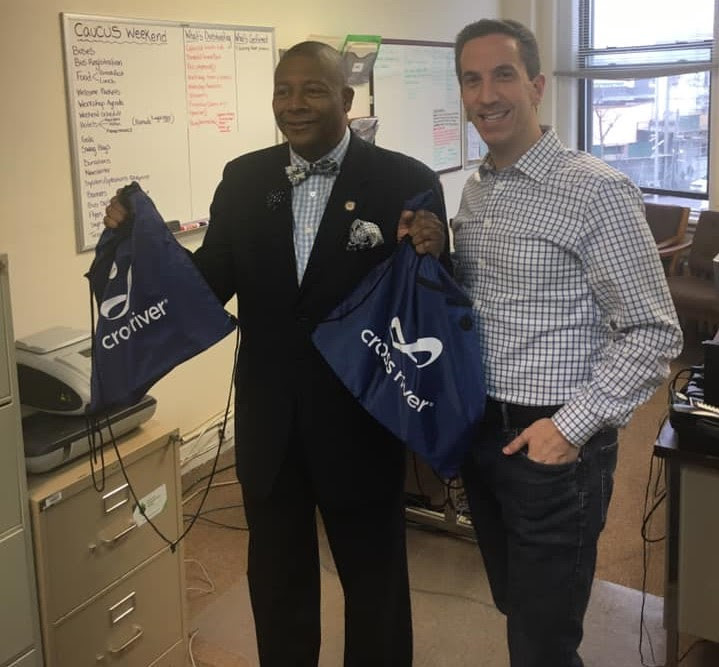 Former Assembly Member Phil Goldfeder drops off some donations on behalf of Cross River Bank, the company for whom he now serves as SVP of Public Affairs. Senator James Sanders Jr. (D-Rochdale Village, Far Rockaway) today announced that he is collecting food and other essential items to help federal workers affected by the partial shutdown of the U.S. Government. Senator Sanders’ collection drive is being conducted with support from the American Federation of Government Employees (AFGE) the largest federal employee union – representing 700,000 federal and D.C. government workers nationwide and overseas, and the Rosedale-Laurelton American Legion Post 483, which operates a local food pantry. The government shutdown started on December 22, 2018 over an inability for congressional Democrats to agree on funding President Trump’s proposed wall along the U.S. – Mexico border. It is unclear how long this stalemate will continue but in the meantime, 800,000 federal employees are working without pay or on furlough. Those affected by the government shutdown include agents from the Federal Bureau of Investigations (FBI), Bureau of Alcohol, Tobacco, Firearms and Explosives (ATF), Drug Enforcement Agency (DEA) and U.S. Customs and Border Protection (CBP), as well as staff from the State Department, Coast Guard, IRS, Department of Homeland Security, NASA, the National Park Service, the Forest Service, the Transportation Department, the Department of Housing and Urban Development and the IRS. In the New York City area, the AFGE has over 10,000 members, and of those, 6,000 are not receiving paychecks due to the government shutdown, according to Timothy McLaughlin, National Representative of the 2nd District of the AFGE. He said these members speak to him on a daily basis about their anger, desperation and confusion over their current predicament. “It’s absolutely despicable to have people work and not pay them,” McLaughlin said. Senator Sanders is collecting donations of non-perishable food, toiletries along with baby formula, diapers, and other childcare items for these affected workers. Items can be dropped off at his District Office, located at 142-01 Rockaway Boulevard in South Ozone Park, Monday – Friday, between 9 a.m. – 5 p.m. Those seeking to receive items must present a valid, current, federal ID from one of the agencies affected by the government shutdown. While Senator Sanders is in the process of collecting items, those with immediate needs can visit the Rosedale-Laurelton American Legion Post 483, which operates a food pantry on Wednesdays from 5 p.m. – 7 p.m. It is located at 240-08 135th Avenue in Rosedale, Queens. For more information, contact Senator Sanders’ Office at 718-523-3069. Queens – Assemblywoman Stacey Pheffer Amato (D – South Queens) today reminded all local volunteer groups that the deadline to apply for a 2019 Neighborhood Grant through The Citizens Committee for New York City is January 21st. Pheffer Amato held a grant workshop this past month with local community organizations. The Citizens Committee for New York City awards grants up to $3,000 for neighborhood projects that range over a variety of different areas. Areas include community gardening, visual and performing arts, nutrition awareness, beautification, tenant and immigrant organizing, healing circles, physical fitness, public safety, and many more. Application instructions and guideline can be found by going to the following link: https://www.citizensnyc.org/grants/neighborhood-grants. The last grant winner was won by Perfect Pieces of the Puzzle Inc. An organization fueled to be the leader in autism advocacy, legislation, and research. The organization also has been the leader in school policy for the Department of Education’s District 27; a school district that represents the Rockaways and parts of Ozone Park. In March, Councilman Richards office announced plans to transform the nearly abandoned Thriftway Mall in Downtown Far Rockaway. After decades of neglect, this underutilized property will be transformed into an active village center, bringing new mixed-income housing, modern retail and commercial space, and public space to the centermost part of the neighborhood. Called Far Rockaway Village, the project will anchor the revitalization of the neighborhood, delivering nearly 700 units of mixed-income and affordable housing and over 90,000 square feet of modern retail and commercial space to the center of the neighborhood’s new rezoning area. Further activation of the property could bring additional mixed-income rental homes, along with new commercial and ground floor retail, and open public space to the heart of the neighborhood. Construction of a first phase of the project is expected to be complete by late 2021. It’s been a long wait for economic progress in Downtown Far Rockaway. We’ve laid the groundwork for success and now we must continue to work to ensure this project moves forward rapidly while serving the community’s needs for affordability, quality retail, and good jobs, per Richards Newsletter. An answer to countless calls from the community, this is a major sign of progress for the revitalization of the neighborhood. The project following City Council’s approval of the de Blasio Administration’s plan to rezone Downtown Far Rockaway, which helped to bring $288 million of City investment to the area and will unlock new mixed-income housing, commercial space, open space, community facilities, and better connections to transportation. ● Building a brand new $10 million park on the site of a vacant, City-owned lot. ● New state-of-the-art $40 million Downtown Far Rockaway Library. ● More than $100 million to upgrade sewer infrastructure, expand sidewalks, and create new public plazas. ● Building about 1,600 units of 100% affordable housing on public land committing to finance homes affordable to families making between approximately $30,000 and $78,000. ● Providing free legal services for Rockaway residents facing unlawful evictions and tenant harassment. ● Supporting existing businesses through free legal services and increasing access to other small business resources in addition to securing a study for the formation of a business improvement district. ● Investing $10 million in upgrades to existing schools’ playgrounds, libraries, auditoriums, and science labs, and reserving a site within the Urban Renewal Area for the School Construction Authority to accommodate a new elementary school if needed as the neighborhood grows. 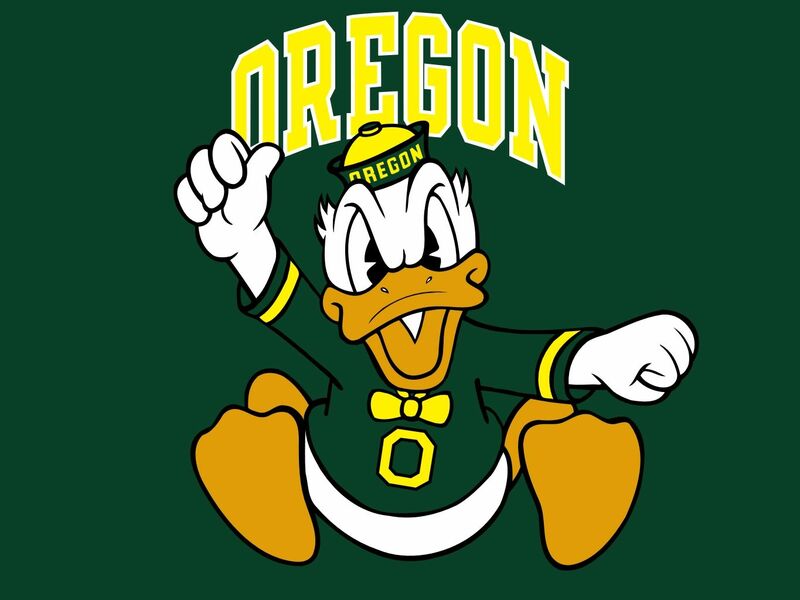 ● Grants for cultural organizations and increased arts programming. ● An additional $250,000 for Rock Safe Streets to expand their anti-gun violence efforts to Redfern. ● Installing real-time bus arrival displays at key bus stops. This Friday May 25th, 2018 at 10:00 AM, Assemblywoman Stacey Pheffer Amato, Senator Joseph P. Addabbo, Councilman Eric Ulrich, Councilman Donovan Richards community leaders, local businesses, residents, and other elected officials will call out the New York City Economic Development Corporation (EDC), for the cancellation of weekend Ferry Shuttle Service on the Rockaway Peninsula, and requesting that they reinstate the weekend shuttle service immediately. EDC contacted local elected officials and community leaders last week to inform them that weekend service for the Rockaway Shuttle Bus will no longer be an option as of today. EDC stated that the removal of weekend shuttles was due to “trade-offs” and “lack of ridership” even though they have increased ferry boat sizes and frequency of travel throughout the summer months. Pheffer Amato, Addabbo, Ulrich, and Richards are calling on EDC to reinstate the ferry shuttle for weekend service immediately. The Ferry has become an integral part of the community not only for residents but for the millions of visitors across the city and state and lack of shuttle service will leave thousands of ferry users stranded. WHAT: Press conference to demand the EDC to continue the Free Ferry Shuttle Service on weekends throughout the Rockaway Peninsula. WHO: Assemblywoman Stacey Pheffer Amato, Senator Joseph P. Addabbo, Councilman Eric Ulrich, Councilman Donovan Richards, community leaders, local businesses, residents, and other elected officials. WHERE: Rockaway Boardwalk at Beach 108th Street. State Senator James Sanders Jr. (D-Rochdale Village, Far Rockaway) will announce at a press conference on the steps of City Hall that he plans to sue in civil court a couple from Far Rockaway for $1 million because they intentionally tried to defame him by spreading lies that he sought a bribe. Moses and Rivera went so far as to take their claim to investigators. Culinary Kids, Culinary Arts does not have 501(c)3 status and could not have received discretionary funding in the first place. Even, hypothetically, if money were to have been given, it would have had to go through a city agency – the Parks Department, because the land they wanted to utilize was parkland. The Parks Department would have then reimbursed them for the money they spent if they were able to document their expenditures with receipts. Who: State Senator James Sanders Jr. 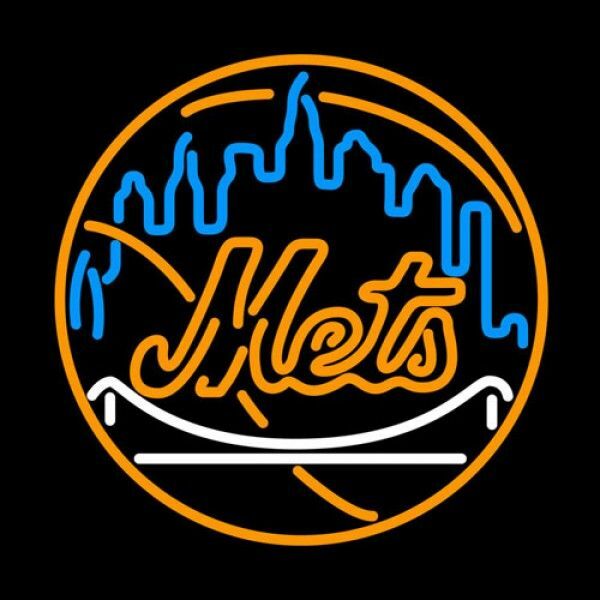 When: May 20, 2018 at 12 p.m. Please note: Most organizations applied and accepted the fund after the pipeline project was complete. The funds are also not used to pay organizations off for any benefits to Williams Partners. Without further ado, the full list of all grant recipients. Williams – a major operator of natural gas infrastructure in New York – today announced the latest recipients of the Rockaway Community Grant Program, awarding grants to 25 local organizations. The Rockaway Community Grant program was designed to benefit the environment and local communities in which Williams operates its Transco natural gas pipeline near Rockaway, N.Y. The company has awarded nearly $900,000 since the grant program was first initiated in 2014. Can we ask for more money next time? Williams brings in 24 Billion in investment per year. Keep that in mind next cycle when you apply again. 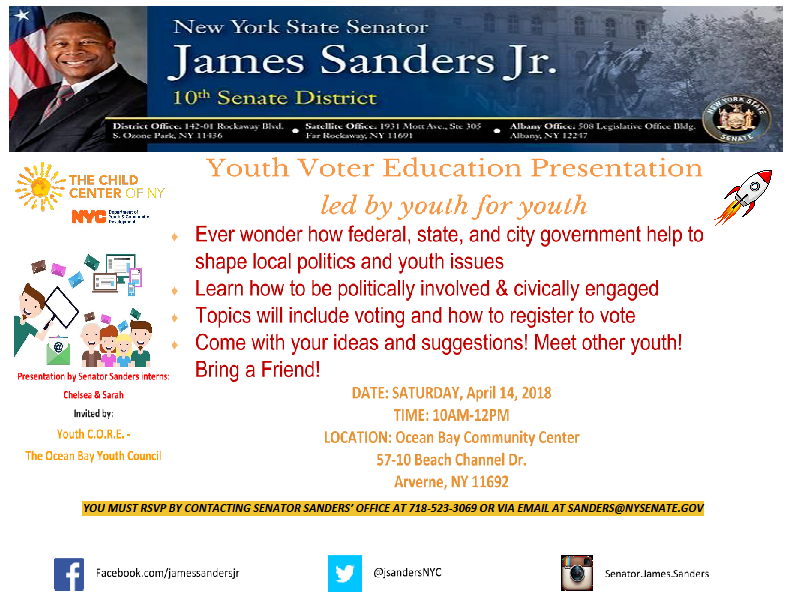 State Senator James Sanders Jr. (D-Rochdale Village, Far Rockaway) will be hosting a Youth Voter Education presentation on Saturday, April 14, 2018 from 10 a.m. to 12 p.m. at the Ocean Bay Community Center in Arverne. The purpose will be to guide youth through the registration process, which is a potential step to expanding the age range of voters. Students will learn how to be politically involved and civically engaged. Topics will include voting, how to register and recognizing our political leaders.